If anyone had any doubt that Asad Umar is the absolute best person in all of Pakistan to manage the economy should watch this interview from today. So, the election day is supposed to be between 25-30 July. After finance minister, the most important post after PM is the CM Punjab. Wonder who could get that? But gaining majority in Punjab still looks a distant dream. Showbaz has been the longest serving CM in Pakistan. I hope we get some one else this time for the sake of democracy, we also need better local governments for equitable development. After Traeen DQ if Ch Nisar had used the timing well during recent events the CM seat was there for him. I think once PTI implement their local government policy, the role of the provincial government will become limited. Development funds will be channelled directly to the local governments rather than to the MNAs and MPAs. PTI can achieve a lot through that, though they likely won't be able to completely implement their healthcare and education policies without winning provincial government. True it's still hard to have a shot at CMship of Punjab for PTI but at least Ch Nisar had more chances of becoming CM Punjab if he joins PTI because there is no way in hell House of Sharif will allow him to be CM under their part umbrella. Kudos to PTI for finding these gems they will really help in policy making! Gaining a majority in Punjab assembly would be extremely difficult. Accountability court verdict is very important in this regard. The focus of #pkNHDR is #InvestInPKyouth but it also includes a decadal analysis of Pakistan's district-by-district performance on #HumanDevelopment. I explore key lessons of #HowWeAreDoing in this essay for @eosmagazine in @dawn_com. The focus of #pkNHDR is #InvestInPKyouth but it also includes a decadal analysis of Pakistan's���� district-by-district performance on #HumanDevelopment������. 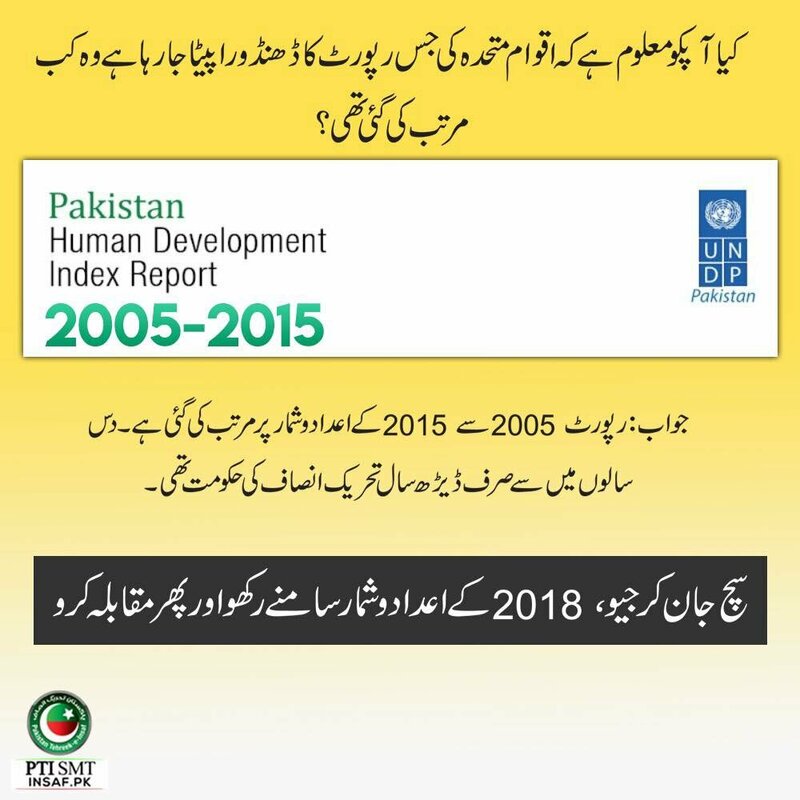 A data collected from 2005-2015 when PTI was in power for just 1.5 years comparing it with nooras punjab where they were ruling from 30 years. Come up with the report from 2013 to 2018 and see your face in mirror than. Last edited by DeadBall; 21st May 2018 at 03:57. The focus of #pkNHDR is #InvestInPKyouth but it also includes a decadal analysis of Pakistan's🇵🇰 district-by-district performance on #HumanDevelopment📈📉📊. Don't know what you are trying to prove here. The report does not even capture anything past 2015. 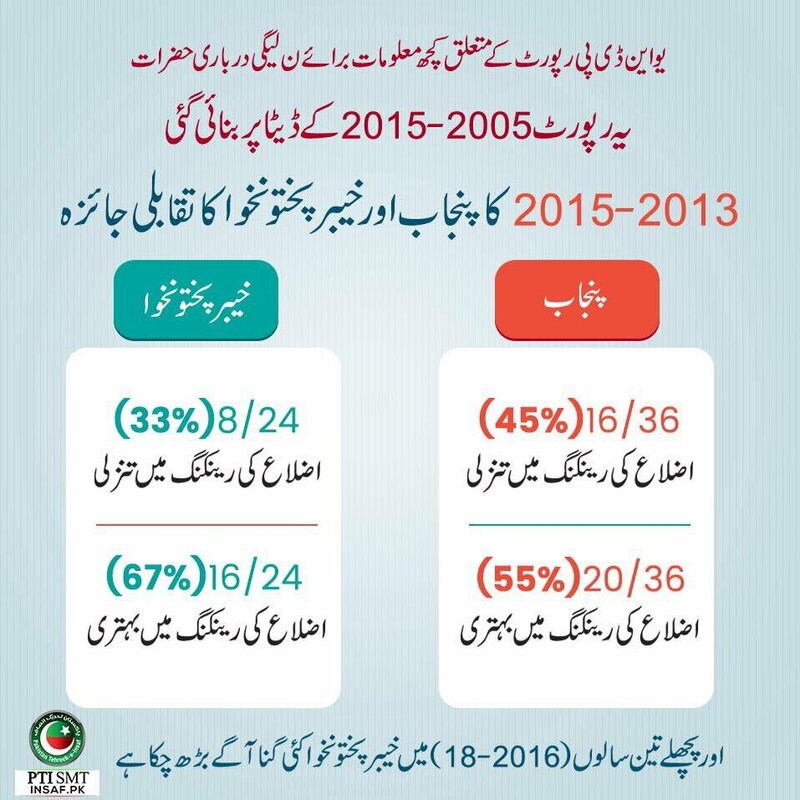 It also shows that KPK has had the fastest HDI growth in Pakistan. This is the first time i saw even some commercial liberals telling off PMLN whattsapp journalists group for spreading fake propaganda against KPK government. When PTI took over in 2013, KPK had seen worst terrorist attacks in our history and these duffers are comparing 1.5 year of KPK performance with their 7 years. Even then when you observe the trend 2013 onwards, PTI was ahead of other provinces but they are comparing 10 years performance which is completely insane. There have been other reports highlighting great work KPK has done but no one ever focused on that, maybe PTI needs to improve it's media management and hire some journalists like PMLN does. One can understand the frustration of nooras and their paid media because it was really hard for them to digest alif aelaan recent survey (liberals are known to support them). Arbab Shehzad was already been doing work on election campaign. He is a retired bureaucrat if i am not wrong. But who is Taimur Jhagra? Arbab Shehzad is a wonder bureaucrat and an ex chief sec of KP. Taimur Jhagra worked for McKinsey and Company, he has more than a decade of experience working with the governments and multinationals organization across Europe, the Middle East, and South Asia. Moved back to Pakistan recently and become part of PTI team and played a major role in policy making. He is the grandson of our ex president Ishaq Khan and nephew of Iftikhar Khan Jhagra. Yeh next wali be tweet kerte na ke jismain mention he data 2015 tak he and KP is making most progress in Human Development. Tasveer ka aik rukh kyun dikhaate ho whatsapp waale lifaafo? Last edited by Mian; 21st May 2018 at 05:16. Overseas Pakistanis will not be allowed to vote, disappointing news. Yes i always knew this was never going to happen, firstly there is no will from government and to be fair it is extremely difficult to make it secure for people voting from all around the world. So many other countries allow it, it could have been done. Postal ballot could have been used. Last edited by Strike! ; 21st May 2018 at 05:32. Looks like Sohail Kamrial didn't even applied for party ticket from Attock. So most likely it's Amin getting ticket from NA-55 (both Amin and Major applied there) and Major Tahir or his son Zain (current MNA) getting ticket from NA-56 (both father and son applied). Major Tahir also applied for a MPA ticket. Postal ballot or voting at an embassy would be so much better and more secure than online voting. Secondly, to end the complication of having different ballots for each seat, they can just add 7 extra seats for overseas voters. Something like 4 from Asia, 2 from Europe, 1 from America + Africa + Oceania. That way, overseas Pakistanis would have actual representation in the National Assembly. Honestly, I think the impact overseas voting would make on PTI's chances is over stated. There are 104 million Pakistanis registered to vote, and only about 50% actually vote, so that's 52 million. Officially there are about 9 million overseas Pakistanis including kids, and also Pakistanis who have no connection with Pakistan anymore but just write Pakistani as their ethnicity on their census form. So let's say about 3 million of those 9 million are eligible to vote, and for argument's sake, let's say all of them end up voting. Now we need to consider that overseas Pakistanis include all those Pakistanis living in the Arab Gulf, they make up about 3 million of all overseas Pakistanis, or 1 million of all the overseas voters. A large amount of them are labourers, many from small places in Pakistan which are traditionally PML-N and PPP strongholds. So this would mean that a decent amount of overseas votes may not even be for PTI, but let's just say, for the sake of this argument, every single overseas Pakistani votes for PTI. That would be 3 million votes dispersed in an overall number of 55 million votes. Being extremely generous, it would mean an average 10,000-15,000 extra votes for PTI on the average sized seat. But of course, we need to factor in that it is extremely unlikely that all 3 million overseas voters would end up turning up to vote, and it is really unlikely that all those votes would be for PTI. So realistically speaking, PTI would probably end up with 4,000 - 6,000 extra votes on the average sized seat. It would probably be enough to make a decent impact of 6-7 NA seats, but definitely not enough to get PTI to a 2/3 majority. Islamabad (UrduPoint / Pakistan Point News – 21st May, 2018) pakistan People’s Party (PPP) leader Qamar Zaman Kaira is expected to join Pakistan Tehreek-e-Insaf (PTI), according to media reports. According to a report published in a local newspaper, the PPP leader and former Information Minister has made preparations to join PTI. He has met former lawmakers who have recently joined PTI and minister Nazir Gondal in this regard as they were active members of PPP. These PPP leaders were of the view that they are not being given the respect and importance in the party that they deserve. Kaira has also reportedly consulted other MPAs and active members of his area who suggested him to join PTI. However, the former and key members of PTI from his constituency strongly oppose his joining in the PTI. They have told their senior leadership that if Kaira is included in the party while ignoring them, they will either join Pakistan Muslim League-Nawaz (PMLN) or Pakistan Muslim League-Quaid (PMLQ). The PMLQ leadership has also given a message to PTI to not include Qamar Zaman Kaira and Tanvir Ashraf Kaira in the party as they do not have a good impression in the constituency. They served personal interests instead of serving the people while they were in power. This has disappointed the locals. Their political chapter has also been closed like PMLN’s. Earlier, Babar Awan, Firdous Ashiq Awan and Nadeem Afzal Chan from PPP had joined the PTI. How reliable is the above source? PML-N MPA from Sargodha Dr Nadia Aziz joins the PTI. Don't think they are reliable and have seen this many times before. Also, no one on twitter mentioned this which means it is not correct. He shrewdly waited a whole day to issue a statement rather than reply when he was corrected immediately. where is our friend @TalentSpotterPk, any apologies to make? when hell freezes over..they'll come out of the woodwork once the elections are over and not before. Unless its some silly propaganda item from Maryam and her loq iq media cell. So finally MNA Sardar Ashiq Gopang joins PTI from Muzaffargarh, He won his seat as an Independent from NA180 securing 71000 votes (Runner up from PMLN 57000). This means PTI is VERY strong on ALL 6 Muzaffargarh seats, Jamshed Dasti wanted 3 tickets to support PTI but PTI refused as it has strong candidates on ALL constituencies now. To be honest it doesn't matter since quite a few are likely to leave PTI if they don't get the tickets so these analysis can be done once the tickets have been awarded. True. How many tickets do you think PTI would be willing to give these electables? From what i have heard Electibility is third most important after loyalty and character. For example, if party loyalist only got 20-30% of votes winning candidate got in 2013 then unfortunately they will miss out but if they were at least competitive then they will be preferred over electables. I am sure all these sitting MNAs especially who won as Independents will definitely get tickets especially in rural areas. Great now let's just hope PTI dont come with a blunder because they have a habit of shooting on their own foot. I saw a list the other day will find and post it here. Just listening to Fawad Ch's press conference now, he has said that PTI will compete alone, and will not be making any alliances with PML-Q. That seems like the logical thing to do. I think someone who got 35%+ last time around should be seriously considered. I would rather see ideological and old PTI workers in the assemblies rather than electables. First batch of tickets to be announced before 31st May according to Fawad Ch. He has also completely rejected the idea of an alliance with PML-Q or any other party. Note that he specifically mentioned PML-Q. Will be interesting to see what happens. I think seat adjustment in Gujrat is a must. I would rather see PML-Q win that seat than the vote get split, and PTI end up on top. Pakistan ideally need a ranked voting system or a two round system to eliminate such scenarios. Last edited by Mian; 21st May 2018 at 17:56. Rajanpur NA-194, PMLN at 45% PTI at 35% and PPP at 12% according to Habib Akram. Aage bhag peeche chor kia hua teri UNDP reprot ka janza nikel gaya jo or cheazain dhun dhund ker la raha he pichli ko defend kerne ki bajaaye? As you are the chief Noora propagandist on the forum now, when is the apology for the blatant lies you posted earlier coming. Dont disappear like Ishaq Dar and claim that you have lost your memory, dont blame it on the children. Lets hear the apology. Gate number 4 & NAB in one line. Still defeat for the laundry and it's players is imminent. Geo is still used a source- you must be desperate. I too hope that those days never ended. That is really good news. Seems like IK might just pull it off and be the next PM. Out of 10, 7 QWP MPAs have left party, Remaining 3 MPAs includes Aftab sherpao's son and, AneesA Zaib(reserve seat). There will be public holiday on Election day. If I remember correctly you predicted around 80-90 seats for PTI before all these inclusions happened... do you think now that all these electables are joining will PTI be able to get around 120 seats? It is important the caretaker PMs and CMs are men/women of character and not shah se zayda shah ke wafadar. Elections can be won or lost with their help. Wasn't the Urdupoint the same garbage news paper that spread the rumour that IK's wife has left him and gone home? PTI’s seat adjustment with the PML-Q is a must for Kasur.In the last election, there were three seat for the taking if there was an alliance between the two parties. IMHO Care Taker CM Punjab matters more than care taker PM. CM Punjab will control the whole machinery/bureaucracy of Punjab and Punjab is what you need to manage to form government.